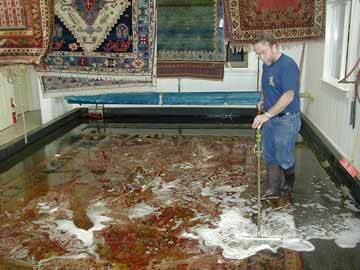 Rugs are cleaned over a period that lasts approximately 3 weeks. If your rug comes to us the day or week we're picking up clean rugs/dropping off dirty rugs, you may be without your rug for nearly 6 weeks, so please use this schedule as a guideline of when we expect to make our next trip. and our expert Rug Repairer as well. Please also use this schedule for those services. end of day, 5 PM, on Tuesday, April 23rd. These rugs, without any extreme urine, repair work or live moth issues, should be available Thursday, May 16th. No appointment is needed to drop rugs off or pick them up. We now have direct parking in front of the store, but the bus stop we used for wash drop off / pick up was eliminated in the Main St. redesign. If you would like a visual, click here. Please note this alley area is strictly for the convenience of quick 'drop off' / 'pick up' only. You do not need to come up to the store for us to process payment a credit card payment; you can stay with your vehicle while we do that upstairs.